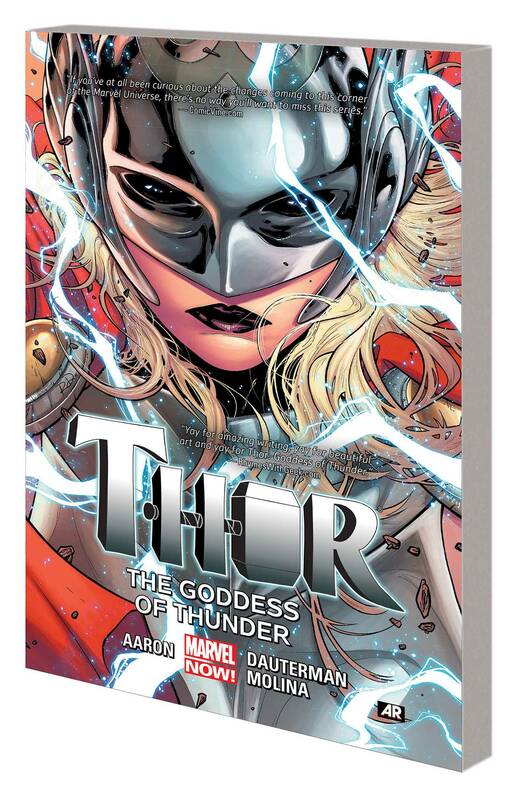 THOR: Goddess of Thunder (Thor 2014 #1-5)! Mjolnir lies on the moon, unable to be lifted! Something dark has befallen the God of Thunder, leaving him unworthy for the first time ever! But when Frost Giants invade Earth, the hammer will be lifted – and a mysterious woman will be transformed into an all-new version of the mighty Thor! Who is this new Goddess of Thunder? Not even Odin knows, but she may be Earth’s only hope against the Frost Giants! Get ready for a Thor like you’ve never seen before, as this all-new heroine takes Midgard by storm! Plus: The Odinson clearly doesn’t like that someone else is holding his hammer – it’s Thor vs. Thor! And Odin, desperate to see Mjolnir returned, will call on some very dangerous, very unexpected allies. It’s a bold new chapter in the storied history of Thor! Jason Aaron Talks New Thor!